Check this out. It’s the cover to my book, Odd Men Out. I’m still in awe of how cool it looks. Such amazing detail. I couldn’t be happier. The wonderful artist, Bradley Sharp, managed to fit in so much from the story without overcrowding the cover. You can see the main characters in silhouette at the bottom, the city of Santa Rosa in the middle, and the Airship Leonidas Polk at the top. What’s everything mean? You’ll have to read the book. 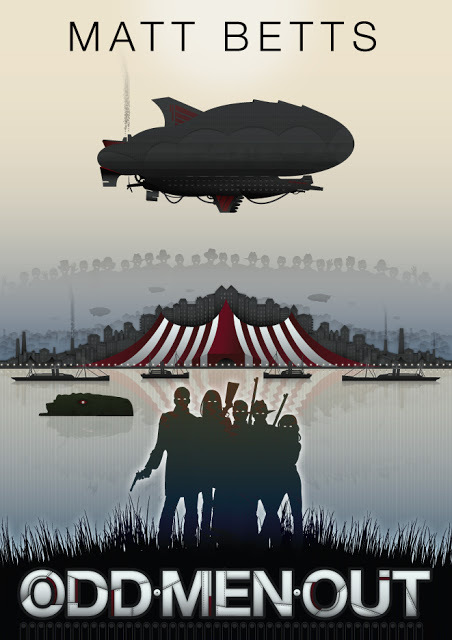 The short version: Fighting for survival in a post-Civil War America overrun by zombies, Cyrus and Lucinda join a military group called the Odd Men Out, and together they face a terrorist army from the North in a showdown over a weapon of enormous power. The long version: The Civil War went on far longer than anyone expected, prompting the North and South to call a truce to fight their common enemy: The Chewers – dead men come to life to attack the living. As a result, a peacekeeping force called the Office of Military Operations is created to watch over the tenuous peace. They also have to contend with a larger threat – Drago del Vapore – a giant lizard attacking the West Coast and wreaking havoc on everything it encounters. As the two sides face off against each other and the huge beast, Cyrus feels more and more like an Odd Man Out and finds it harder and harder to stay out of the fight. Check out more of Bradley Sharp’s work here – http://www.bradsharp.co.uk/. You can also see Bradley’s cover for Mike Resnick’s book “A Miracle of Rare Design” here, and take a look at what he did for K. Ceres Wright’s “Cog”.